Department of Art | Owen Mundy: "I Know Where Your Cat Lives"
Home » News » Owen Mundy: "I Know Where Your Cat Lives"
Owen Mundy: "I Know Where Your Cat Lives"
The College of Fine Arts is proud to congratulate our own Department of Art Faculty, Owen Mundy, who was recently featured in several news articles all over the web such as TIME , The New York Times, USA Today, Wired UK, The Daily Dot, Vice: Motherboard and many more. 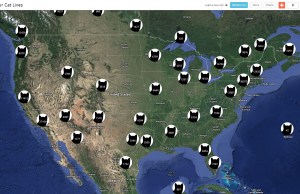 This project, titled “I know where your cat lives” is a data experiment that collects information from several social media sites such as Instagram and Flickr when images are tagged with the word “cat”. 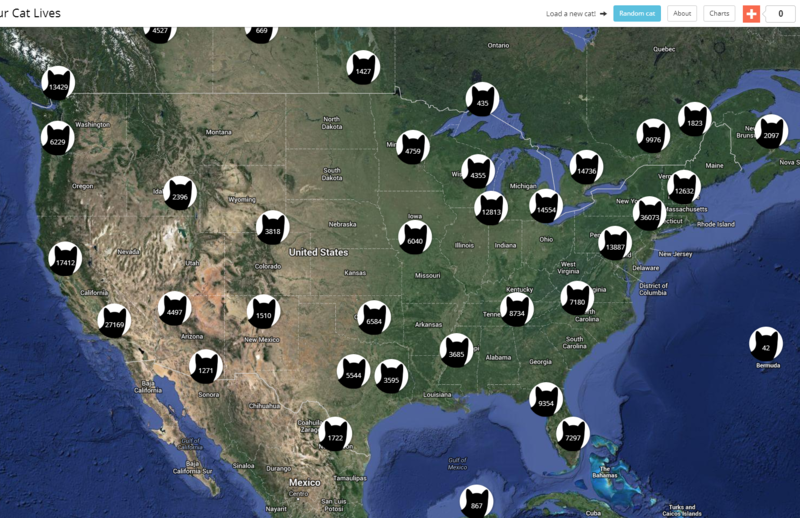 The program later strips all the metadata to find geo-coordinates of where these pictures were taken and therefore creating a map with a million cat pictures found online organized by location. The official site, “I Know Where Your Cat Lives“, allows anyone to view these cat pictures from all around the world and all around the web. The site also provides interactive charts with information and data collected through this project and presents them in a visually pleasing way for viewers to enjoy. 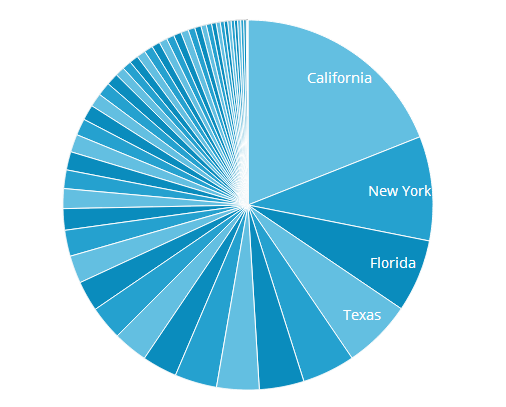 Pie Chart depicting number of cats in the usa by state. In an interview with Audra Schroeder from The Daily Dot, Mundy also talked about how he came up with the idea. Images courtesy of I Know Where Your Cat Lives. Owen Mundy is an artist, designer, and programmer who investigates public space and its relationship to data. His artwork highlights inconspicuous trends and offers tools to make hackers out of everyday users. 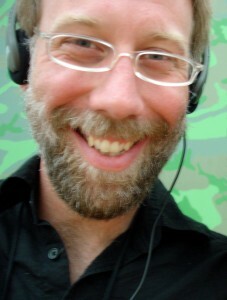 After working as a photographer in the U.S. Navy he earned a BFA in Photography from Indiana University in 2002 and an MFA in Visual Arts from the University of California, San Diego, in 2008 and is a Professor of Art at Florida State University. For more information about Owen Mundy and his work, visit FSU Department of Art Faculty Page or Owen Mundy’s Website. If you are interested in learning more about this project or contributing to the campaign, visit the “I Know Where Your Cat Lives” Facebook Page. To watch the clips featured in today’s news, visit KTLA-LA (WB) and CNN Headline News. A Special Thank You to Florida State University Research Computing Center and Office of Undergraduate Research who provided funding and a UROP student.